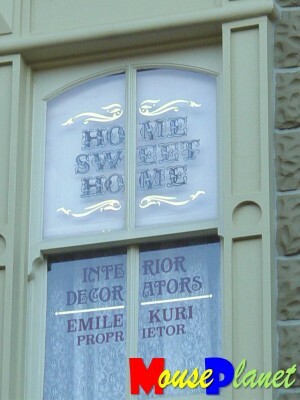 Many people know that the names on the second-story windows on Main Street, U.S.A. in the Magic Kingdom have a special significance in Walt Disney World history. There is a metaphor that compares the Magic Kingdom in Walt Disney World to a movie. In this metaphor, the red walkways approaching the Magic Kingdom represent the red carpet to the entrance. The entry tunnels through the railroad station represent the theater lobby, which contains posters of coming attractions (literally). Continuing the metaphor, the windows over the shops on Main Street, U.S.A., represent the opening credits as you walk into the park. In the same fashion, they serve as the closing credits before you walk out of the park, through the railroad station tunnel lobby, and back down the red carpet. 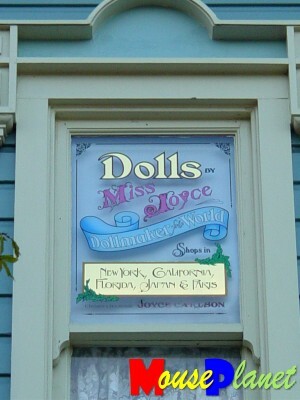 In this three-part series, we look at these Main Street windows, along with some information about the names on each window. Some of the information come from the list maintained at City Hall, but that book is hopelessly out of date. [Note to Walt Disney World management: somebody needs to fix this!] Other information comes from my own research. I've noted my sources at the bottom of the article. Without any further ado (and in no particular order), let's get started. 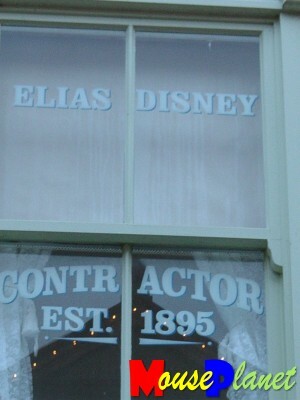 Elias was Walt and Roy O. Disney's father. 1895 was when he started his own contracting business in Chicago, one of many failed businesses. This window used to be over the Emporium, but was moved to east Center Street recently. Where it all started: Elias Disney, father of Walt and Roy O. Disney. Photo by Mark Goldhaber. Walt's eldest daughter Diane and her family are honored in this window. Photo by Mark Goldhaber. Diane Disney Miller was Walt's eldest daughter. Her husband Ron worked his way up through the company, eventually becoming president of Walt Disney Productions, and held the post immediately prior to the arrival of Michael Eisner. 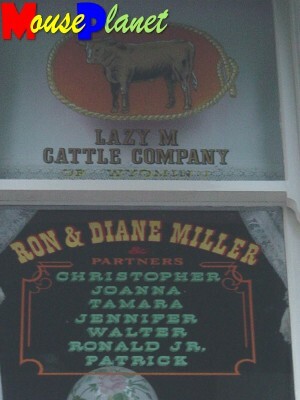 The Lazy M is the name of their ranch in Wyoming. The other names are the names of their children. Roy Edward Disney, Vice Chairman of the Walt Disney Company, is the son of Roy Oliver Disney and the nephew of Walt Disney. Roy, obviously a sailing enthusiast, is listed with his wife, Patty, and their four children. The late Sharon Disney Lund was Walt's younger daughter. She married William Lund after the death of her first husband, Bob Brown, from cancer just a year after Walt's death. Their three children are also honored. This window honors the surreptitious process of acquiring the land in Florida to build Walt Disney World. The late Donn Tatum was the former President and Chairman of the Board of Walt Disney Productions, and the first non-family member to head the Company. The list of subsidiaries is made up of the names of the skeleton companies used in the land acquisition process. Tatum passed away in 1993, and was named a Disney Legend the same year. Pseudonyms: the key to buying land without warning people that you are coming. Photo by Mark Goldhaber. This window also honors the acquisition process of the land for Walt Disney World. 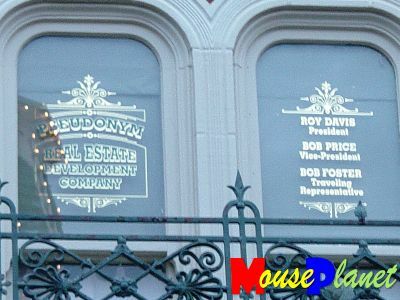 Roy Davis is the pseudonym used by Roy O. Disney when visiting the properties and the real estate agents in Florida. Bob Price was the name used by Robert Bob Price Foster in his dealings with landowners and agents in Florida. Lake Buena Vista and Bay Lake are the municipalities in which Walt Disney World is located. Kansas City was originally believed to be the home base of the land purchaser, since Foster always stopped there on his way back to California to avoid suspicion (and visit his mother in the process). Browning, an attorney and financial expert, introduced Roy O. Disney to the concept of convertible debentures, bonds which could be converted into stock when the stock rose to a certain price. These rose to a certain price. These debentures were what allowed Roy to raise the cash to build Walt Disney World without having to succumb to the pressure to merge with another company to raise money, an idea with which he was soundly against. The late Major General William E. Joe Potter, the first Disney employee in Florida, was hired by Walt Disney to direct the construction of the infrastructure of Walt Disney World. Potter had a great deal of earth-moving experience with the Army Corps of Engineers and the New York World's Fair. General Joe had also served as Governor of the Panama Canal Zone. He became the park's senior vice president after it opened, before retiring in 1974. He passed away in 1988, and was named a Disney Legend in 1996. 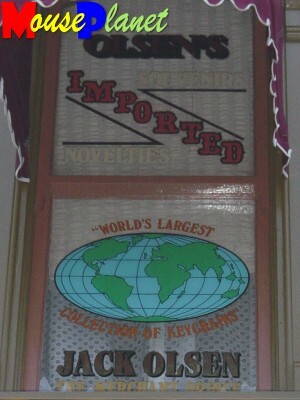 The décor at Walt Disney World is largely the handiwork of Emile Kuri. Photo by Mark Goldhaber. Kuri was the chief interior and exterior decorator for Walt Disney World and Disneyland, as well as company executive offices, following his set decoration experience at the Walt Disney Studios. 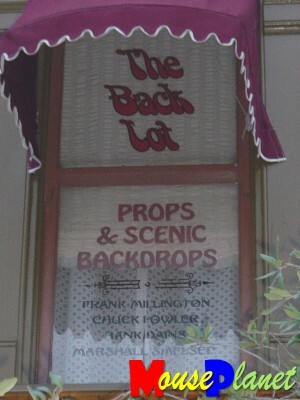 Millington, Fowler, Dains, and Smelser were members of the Walt Disney Studio decoration department who moved on to the decoration of Walt Disney World after 1971. Walt Disney Studio decorators come to Walt Disney World. Photo by Mark Goldhaber. Buddy Baker scored many movies and attractions, including writing Grim Grinning Ghosts with X. Atencio. He was named a Disney Legend in 1998 and passed away in 2002. Bob Jackman had been the manager of Disney's music department since 1955, and co-wrote many tunes, including the Swisskapolka heard in the Swiss Family Robinson Treehouse. Incidentally, he also provided Goofy's voice in a number of 1950s cartoons. George Bruns is responsible for composing a great deal of memorable Disney music, including the Ballad of Davy Crockett, Yo-Ho (A Pirate's Life for Me) from Pirates of the Caribbean, and a great deal of the area music around the parks. Bruns retired in 1975 and died in 1983. Ron Logan, a 41-year Disney veteran, is honored for his contributions. Photo by Mark Goldhaber. Logan was a consultant for Disneyland Entertainment beginning in 1960. In 1978, he was serving full-time as music director for the Walt Disney World Resort. He later became Vice President of Creative Show Development, and eventually Executive Vice President of Disney Entertainment before his retirement in 2001. Owen Pope ran the pony farm at Disneyland, assembling and training the horses and ponies to handle the stress of working in a crowded park, then moved on to Walt Disney World's Magic Kingdom to establish the pony farm there, as well. If you are a President, this man has designed your clothes  at the Hall of Presidents, at least. Photo by Mark Goldhaber. 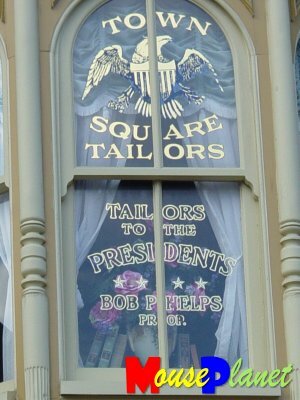 Phelps designed the costumes for the Hall of Presidents, among other attractions. It's a small window after all: the maker of the dolls. Photo by Mark Goldhaber. Carlson started with Disney in the traffic department in 1944, and quickly became an ink-and-painter. She moved over to WED Enterprises in 1960, and eventually created the prototype dolls for the it's a small world attraction, among other attractions. The locations refer to the locations where the attraction has been installed: the 1964-65 New York World's Fair, Disneyland, Walt Disney World, Tokyo Disneyland, and Disneyland Paris. She retired in 2000, and was named a Disney Legend in the same year. Lindquist started as the advertising manager at Disneyland in 1955, was named Vice President of Marketing for both Disneyland and Walt Disney World in 1971, and became President of Disneyland in October 1990. He retired in 1993, and was named a Disney Legend the following year. A long-time, steam-train enthusiast, Vilmer oversaw the refitting of the steam locomotives for the WDW Railroad in Tampa. The cars were found still in service in Mexico's Yucatan Peninsula. This group were all members of the Legal Department. McClure, one of Roy's Boys, represented WED Enterprises. Morrow served as General Counsel for Walt Disney Productions and was on its board from 1971 to 1984. Wanna buy some cool stuff? Here's the guy to thank. Photo by Mark Goldhaber. After running the Disneyland merchandise operation for many years, Olsen started the merchandise operation at Walt Disney World, and ran both until his retirement in 1977. 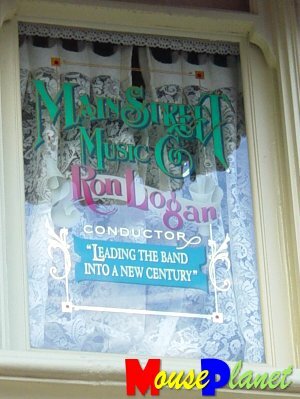 We continue our look at the Windows of Main Street.